In 2019, the American Cancer Society estimated that approximately 48960 people diagnosed with pancreatic cancer. It makes up about 3% of all kinds of cancers in the US but accounts for up to 7% of cancer deaths. In fact, pancreatic cancer starts in your pancreas tissues, which is a pear-shaped organ seated at the lower area of the stomach. Cells in your pancreas will begin to multiply out of your control and then form a mass, which causes a cancerous tumor. This condition may damage the 2 main functions of your pancreas, including secreting insulin that assists your body in processing sugar and enzymes aiding digestion. This disease almost occurs after the age of 45 although it may also affect to younger people. Until now, people have not found the exact reason causing this cancer; however, there are some certain factors increasing your risk of pancreatic cancer such as pancreatitis, obesity, inherited gene mutations and family history of this kind of cancer, excessive smoking, and diabetes. Besides, African-Americans also have a higher chance of getting this problem. It is difficult to detect pancreatic cancer early and this cancer often spreads rapidly, which affects to other body parts. This is the reason why people call it as a silent disease. In fact, there are also certain early pancreatic cancer symptoms; however, people often do not notice them as these symptoms are very nonspecific. Therefore, being aware of these early signs and symptoms may help you to save yourself and others. Today, in this writing, VKool.com will introduce top 10 early pancreatic cancer symptoms in females. This article listed the early signs of pancreatic cancer in women from reliable sources. However, it is for the informational purpose. Keep following this writing to know pancreatic cancer symptoms and see if you are in this condition! Both back pain and abdominal pain are also popular symptoms in those diagnosed with pancreatic cancer. The sharp pain is usually felt in your upper abdomen and then radiates gradually toward your back. Many people suffering from pancreatic cancer also report that they suffered from the severe pain more at night and they blended forward to get a slight relief from this condition. A study in 2019 found that pancreatic cancer patients may have abdominal pain because the tumor size increases, invasion of the lymph node metastasis, anterior pancreatic capsule, and intra-pancreatic nerves. If you have difficulty in reducing the pain of mild and moderate abdominal, you should consult your doctor. Most patients having severe abdominal pain are diagnosed with pancreatic cancer. In fact, the area in which you feel pain is also beneficial in determining the tumor location. 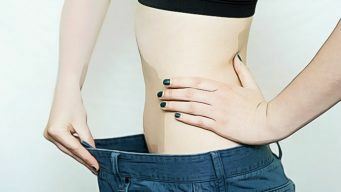 Losing weight with no reason is another warning symptom of various kinds of cancer, which includes pancreatic cancer. Losing weight often happens when a tumor moves to other nearby organs to reduce their functioning. This, in turn, affects the process of digesting nutrients and also causes poor appetite. In addition, because of lacking pancreatic enzymes which aid in digestion, dietary fats will begin to pass through your body without being digested and thereby causing weight loss. Moreover, the cells of cancer will kill healthy cells contained in nutrients. Hence, if you start to suddenly lose weight without having no change in your physical activity or diet, immediately consult your doctor. Another of top 10 pancreatic cancer symptoms is the change of color in your urine although you drink enough fluid during your day. Your urine can transfer into the darker, brown shade or amber color if you have pancreatic cancer. A growing tumor in your pancreas may cause bile to make it get blocked and then not released from the body as usual. In addition, the large amount of bilirubin in your body may also get into the urine and thereby make it dark. At times, you may find the appearance of blood in the urine. If you see that the urine color becomes darker without any explanation, you must find out the reason causing it. Because the pancreas is a vital part of your digestive system, the appearance of a tumor may lead to several gastrointestinal signs, including gas, bloating and inflammation in your abdomen. Generally, gas and bloating often develop after you have a meal and can even be gone with indigestion or heartburn. These pancreatic cancer symptoms & signs happen when the pancreatic tumor starts getting pressure on your abdomen and stomach, which makes it difficult for your stomach to have a proper functioning. If you begin to have bloating and is not better after using medicine, you should see your doctor again. If you are suddenly diagnosed with diabetes with no apparent reason or any family history of this problem, you can have a risk of pancreatic cancer. A pancreatic tumor may destroy cells making insulin in the pancreas, which leads to diabetes. You may suffer from some common symptoms of diabetes such as urinary urgency, constant fatigue, numbness in your toes and fingers, and vision conditions. Hence, if suddenly suffer from diabetes with no reason, you should choose to screen for this pancreatic cancer regularly. Read more: Blue heron guide to beat diabetes review – is it reliable? If you feel weak and fatigued despite no physical activity, this may be one of the early pancreatic cancer symptoms. In this condition, fatigue can be caused by the growth of the tumor size day by day, lacking sleep because of pain and other reasons as well as anemia because of losing appetite. Besides, not eating properly also affects to the level of energy and then you can feel that you have to relax and sleep. So, remember if you feel fatigued and weak even after you get more time to rest and sleep, you should see the doctor immediately to get diagnosed with your condition. It may be a symptom of various cancers or other health conditions. Early diagnosis will increase the rate of cure. People having pancreatic cancer may also see that they have a sudden drop in appetite and tend to feel full although they eat very little. Because the pancreatic tumor begins growing, it may make pressure on your small intestine or stomach, which makes your digestive tract get blocked. This will make you feel full after consuming very little and then lead to a significant appetite loss and weight loss. Remember that changing in appetite significantly may make you tired and weak, which will make it difficult to treat as well as recover. Stools of those who have pancreatic cancer also have a few distinct characteristics. The stools can become big, oily, pale, smelly, and float because the tumor growing in pancreas prevents it from releasing the enzymes aiding in digestion. These enzymes are essential to help in digesting food, particularly fatty food. And the fat undigested will ultimately end up in the stool, which makes it look greasy or float. It is very difficult to remove these fatty stools. Moreover, stools will change into a lighter color because of the deficiency of bilirubin. Because the consistency and color of your stool will show you a lot about the health condition, you should report to your doctor if noticing any change of stool. Vomiting and nausea are others of early pancreatic cancer symptoms. Because the tumor grows in your pancreas, it will block some parts of your digestive tract, hampering the overall process of digestion. Besides vomiting and nausea, you can also suffer from acid reflux and heartburn. Because the interference with excretion processes and normal digestion may lead to vomiting, both vomiting and nausea are not necessarily related to cancer. You may try drinking ginger or peppermint tea to reduce nausea. If these symptoms have a tendency to worse after you eat and make you more difficult to consume anything, you should see your doctor to get advice. It is popular for those suffering from pancreatic cancer to suffer from jaundice, which is characterized by yellowing of their skin or eyes. Jaundice may also make your feet and hands (particularly the soles and palms) itching. Tumor located in your pancreas head may cause irregular bile that flows from your gallbladders into your small intestine. This, in turn, causes the buildup bilirubin in your blood, which is one of the reasons causing jaundice. If you notice any sign of jaundice, you should consult the doctor because it is a popular symptom of several gallbladder and liver diseases as well as pancreatic cancer. If you want to know more about other signs and symptoms of various conditions and diseases, please go to visit our main Health page. After reading the writing about top 10 early pancreatic cancer symptoms in females, hope that it can help you to know the early and common pancreatic cancer symptoms in women. However, the article is only for the informational purpose; therefore, you should see your doctor to get the best diagnosis. If you have any question related to any problem, please leave your comments below, I will respond you soon. Also, if you know other pancreatic cancer symptoms in females, please share them with us.